On this occasion and celebrating the 10th anniversary of her association, HSH Princess Stephanie, Founder and President of Fight Aids Monaco (FAM) as well as UNAIDS International Goodwill Ambassador and her team, organized different communication and prevention operations, as well as their traditional fundraising event benefiting their association. 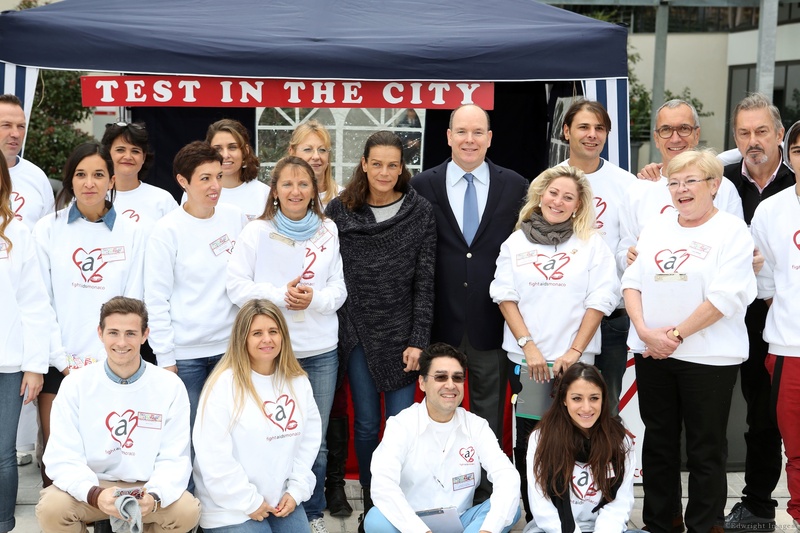 On Monday, November 24, 2014, the operation “Test in the City” marked its 5th year in the Principality in partnership with the Princess Grace Hospital, its Emergency Service, as well as the Monegasque Red Cross. It is an anonymous screening test, free of charge and fast, with results within 10 minutes. In French the kit is known as TROD (Test Depistage rapide a Orientation Diagnostique), equivalent to Rapid HIV Testing in English, and enables to detect anti-HIV-1 and anti-HIV-2 antibodies by a simple finger prick, than can easily be carried out by non-medical people who are nevertheless trained in this procedure. The main objective of this screening is to keep people informed of the latest scientific advances, learn how to protect oneself and others, and most importantly put an end to stigma and discrimination. 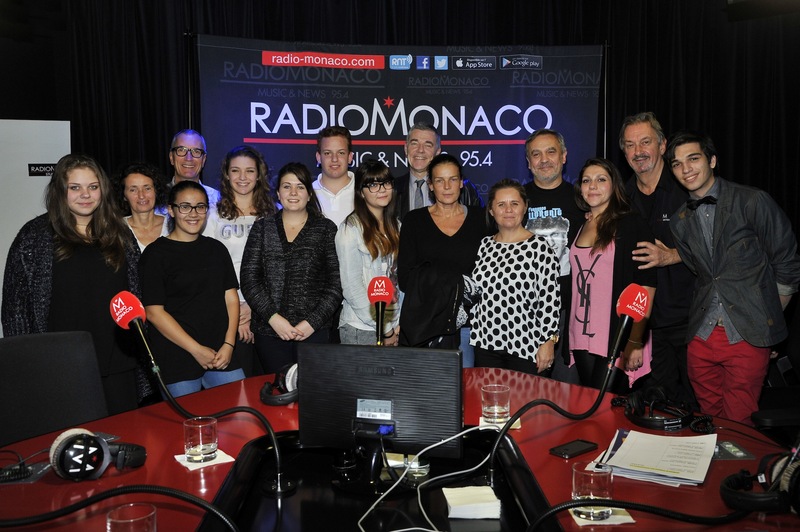 Radio Monaco hosted a new episode of Jungle Fight on Thursday, November 27, from 17:00 to 19:00hs, with the live participation of Princess Stephanie and Malher. It is the only monthly radio program dedicated to the fight against AIDS that has been running for over 5 years. The broadcast was an excellent opportunity to review the research and campaigns carried out in the fight against AIDS, and help end up discrimination and false ideas about the disease. The 4th edition of the AIDS Memory Quilt (Courtepointes in French), is a work of art on canvas, both individual and collective that honors AIDS victims. In 1987 the “Names Project Aids Memorial Quilt” foundation came up with this initiative to illustrate the devastation caused by the disease. Each quilt is made of 8 canvas sewn to each other, over a surface of 4m x 4m, all bearing the name of a victim and they were all produced by people of Fight Aids Monaco, most of them living with HIV. These quilts were exposed in the entrance of the Oceanographic Museum on Friday, November 28. It is a way of saying that victims will never be forgotten. With the generous support of Barclays Monaco a new edition of the FAM Charity Auction took place at the Meridien Beach Plaza Hotel on Monday, December 1, 2014 in the presence of HSH Princess Stephanie accompanied by her brother HSH Prince Albert II. Dame Shirley Bassy, Dmitry Rybolovlev (president AS Monaco), and Kenzo Takada were among the many distinguished guests. There were 58 works of art (sculptures, paintings, photographs, lithographs) generously donated by the artists or collectors, auctioned under the expert hammer of Maitre Francois Tajan from Artcurial. More than Eur 380,000 were raised in this traditional art auction that will enable the association to continue their actions. The truth is that HIV has not been eradicated yet and there is still a vital need to raise money, increase awareness, fight prejudice and improve education. My husband and I had the pleasure to be seating with our friend Michel Merket and Patrick Schaeffer, Treasurer of FAM, and both men were constantly outbidding each other in acquiring beautiful art pieces, but their main objective was to increase the amount collected that evening. Generosity at its best! 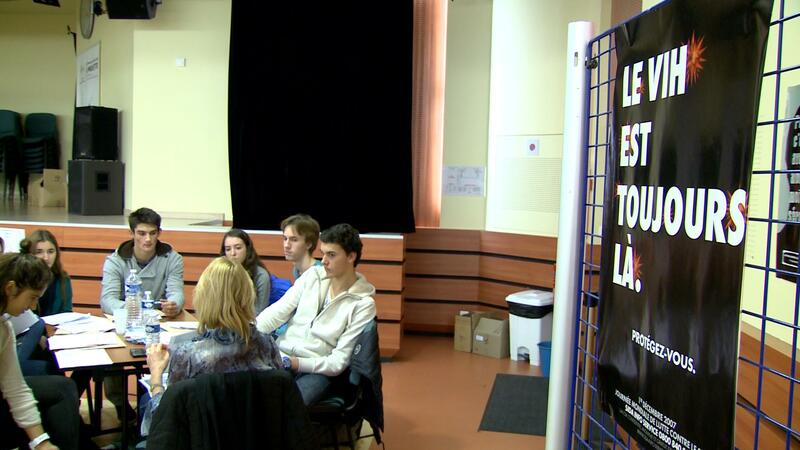 The Department of Education, Youth and Sports in partnership with Fight Aids Monaco, participated in different events organized at the College Albert I within the framework of AIDS-Info from November 27 through December 3, 2014. The close collaboration among the Department of Education, the Direction of Health and Social Affaires and the Center for Free Anonymous Screening, has enabled college students to attend interactive workshops and conference on AIDS. The objective wasto establish a useful dialogue with the students to create awareness on the evolution of the AIDS epidemic, new available treatments, emphasizing the need for individual protection and prevention. HIV continues to be a major global public health issue, having claimed more than 39 million lives so far. In 2013, 1.5 [1.4–1.7] million people died from HIV-related causes globally. There were approximately 35.0 [33.2–37.2] million people living with HIV at the end of 2013 with 2.1 [1.9–2.4] million people becoming newly infected with HIV in 2013 globally. Sub-Saharan Africa is the most affected region, with 24.7 [23.5–26.1] million people living with HIV in 2013. Also sub-Saharan Africa accounts for almost 70% of the global total of new HIV infections. There is no cure for HIV infection. However, effective treatment with antiretroviral (ARV) drugs can control the virus so that people with HIV can enjoy healthy and productive lives. In 2013, 12.9 million people living with HIV were receiving antiretroviral therapy (ART) globally, of which 11.7 million were receiving ART in low- and middle-income countries. The 11.7 million people on ART represent 36% [34–38%] of the 32.6 [30.8–34.7] million people living with HIV in low- and middle-income countries. Pediatric coverage is still lagging in low- and middle-income countries. In 2013 less than 1 in 4 children living with HIV had access to ART, compared to over 1 in 3 adults.